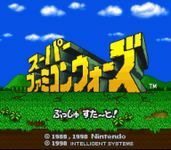 Super Famicom Wars (スーパーファミコンウォーズ?) is a war simulator produced by Nintendo for the Super Famicom. It was released via the Nintendo Power game service on May 1, 1998 and on the Wii Virtual Console on February 16, 2010 in Japan only. It is the follow-up to the original Famicom Wars and a precursor to the Advance Wars series. A new feature in Super Famicom Wars allows the player to select the General for each army. There are over seven Generals, each with his or her own unique ability. There are also eight new units and new facilities such as labs and rail stations.